“The biggest gamble ever taken in aviation history” some say. To build one the largest airports in the world to prepare for a war that hadn't started and to promote trans Atlantic air travel for land based aircraft that didn't exist. The airplane first flew in 1903. Alcock and Brown were the first to cross the Atlantic in an airplane in 1919 non stop. Charles Lindberg flew the first solo non stop flight from the USA to Europe in 1927. 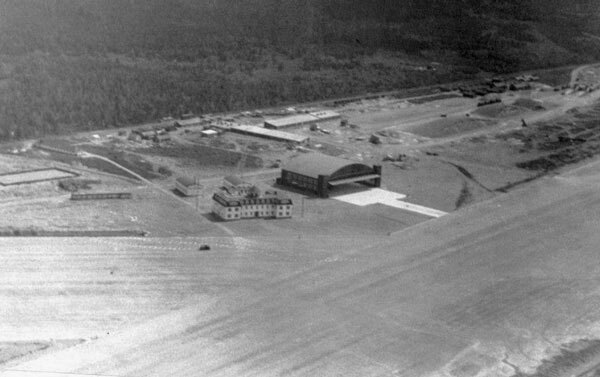 And in 1935 a decision to build the Newfoundland Airport was made. Was there a rumour of war that would require an airport be constructed closest to Europe for the shipment of supplies? To convince politicians to invest tax dollars during a depression must have taken a convincing argument. Be that as it may, an undertaking by the British Air Ministry and the Canadian Government to invest into the construction of a major airport to be located in Newfoundland was made. The location chosen was in the middle of the Newfoundland wilderness with the only infrastructure being a narrow gauge railroad that led to mile post 213 known as Hattie’s Camp. Before work could start the forest was cleared to construct living quarters and cook houses to accommodate the workers. The workers, mostly unskilled, came from the fishing villages of Newfoundland. It was an idea that would become a reality in less time than it takes today to build a section of a major highway. Here they would learn how to become carpenters, plumbers, electricians, and heavy equipment operators. To become the pioneers in this new era of aviation. The links in the column to the left will lead you through this era that put mile post 213 on the world map of aviation.